A. Globalization and human rights. B. Statistics for social control and social change. D. Mentoring and peer counseling in a liberation framework. E. Social work and organizing in oppressed communities. F. Economic justice in deaf communities. A. Joining forces: Building community-academic alliances. B. Teaching about oppression and social and economic justice. D. Organizing the poor across the rural-urban divide. E. University of the Poor: Using media and the Internet to build the movement to end poverty. F. The drug war on the poor. G. Roles for social workers in the penal system. *Feminism on the front lines. A. Organizing in the anti-globalization movement. B. Skills and discipline to lead and organize. C. The corporatization of the American judicial system. D. Arts, culture, and economic justice. E. Social work skills for a post-welfare reform society. G. Economic justice in disabled communities. A. Organizing human rights activism in social work education. B. The economic oppression of youth. C. Social welfare from the Caribbean to Canada. D. Economic development: Tools for justice? E. Economic justice in gay, lesbian, bisexual, and transgendered (glbt) communities. F. Religious strategies in the movement to end poverty. G. Organizing against the death penalty. The working groups of the Schools and Colleges of the University of the Poor will meet. Demonstration march up Broad to Temple University Hospital to call for Quality Healthcare for All!! Afterwards a Kensington “reality tour” and community dinner. Following an orientation by leaders of the Kensington Welfare Rights Union, we will travel through the Kensington neighborhood, experiencing the KWRU “reality tour” of this de-industrialized, multi-ethnic area that captured national media attention during last summer’s Republican National Convention. KWRU leaders will describe the organizing model that has made this area a major center of the growing movement to end poverty. Dinner will be served – and shared – in the community. The “New Freedom Bus” goes to Atlantic City. Replicating the model used by KWRU to help build a national movement to end poverty, we will board a bus and head for Atlantic City. There we will join the South New Jersey Citizen’s Committee – an organization of poor and homeless people, social and human service workers, and other allies – in their rally. 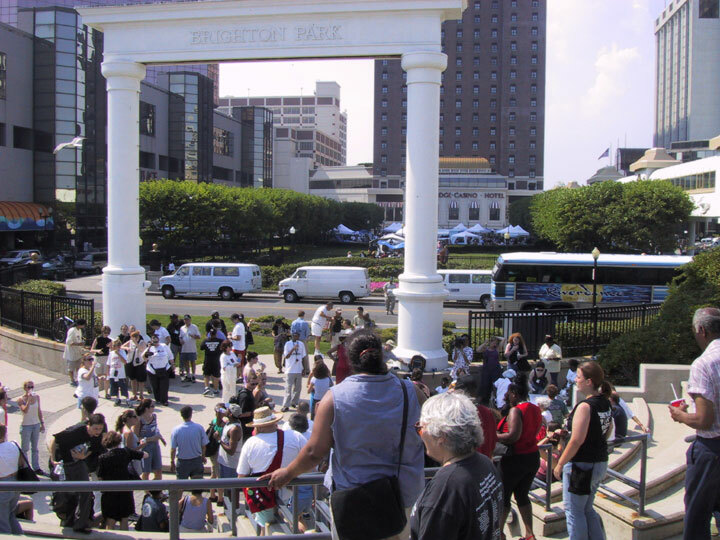 A “educational” on the bus will introduce the Poor People’s Economic Human Rights Campaign (PPEHRC) and the history and mission of the New Jersey group (a member of the campaign). We will also view the video, “Battle for Broad,” and discuss its use as an organizing and movement-building tool. On the return trip we will debrief the action and explore ways to take the campaign to the next level, building a movement to end poverty in our home localities. Conference Reflection/Planning and Pledging. Using experiential methods and discussion, we will reflect on the conference and plan the ways we will carry on the work of Claiming our Economic Human Rights.